"Beautiful youngster, fluidity balanced animated and teamwork. Dog was presented on a loose lead and moved effortlessly at all times. Excellent rear drive, strong topline allowing transmission of power to a beautiful shoulder and reach. Very alert dog, excellent ear set, dark eye, very good expression.."
"... a beautiful sidegaiting dog with a nice topline. Would like to see a little more masculinity." 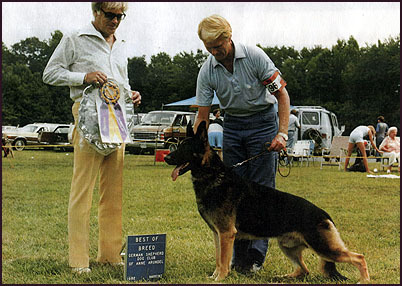 "...another smooth moving, dark male who maintains his outline on a loose lead. Clean." "... As I walked across the grass towards Andretti the first thing I saw was this totally immature animal. He had such long legs, and a long elegant neck, and a long body, and long ears. In fact, the very first thought I had was that he looked like a young deer. He was not a small dog by any means, but a very tall elegant, long boned dog of great stature. His presence was unmistakable, He had a well chiseled head, strong ears like steel rods, and a very intelligent, keen dark eye. He has a beautiful coat and pigment, a well formed croup and tail set, and a tremendous rear, much like his famous mother. He had the presence and tight ligamentation of his breed leading father. This dog looked me squarely in the eye as I approached him in an unflinching attitude. Hmmmm, nice, I thought, but sure immature. Oh well, I want to watch him move, as I believed then, and still do, that if they move right they must be built right. "Take him around" I said, let's see what he's got." "Almost before the words left my mouth he was in motion, striding around the grassy area. It seemed his feet never touched the ground, so swift and lightly he traveled. The length of stride was stupendous, the back was like iron, and the ground flew past this dog. He completed the circle and was back before I had even had time to think about what I saw. "Take him around again" I said, as I had to confirm and make sure what I had seen. Around and around they went, and my head was spinning. Look at that stride! What a great reach and drive, with front and rear perfectly balanced and with maximum reach and maximum drive. There was no way I could fault this movement, it was so very flawless." "This can't be, I thought, he has to have a fault somewhere. So I asked the young lady to take him out and back, as this is where he had to fall apart with all that extreme rear. To my great surprise, he was flawless going away and coming at me. What could I say, I was in love. This dog could move circles around any dog I had seen. I glanced back to the other dog. The large group was still there, They were moving him again, and it was like night and day to me." 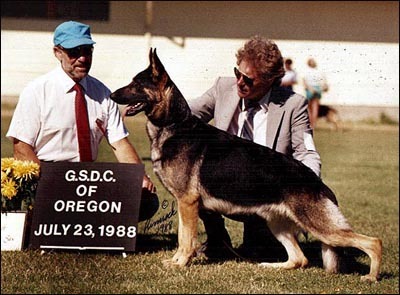 "The other dog was working hard, even though it looked good, he was heavy footed, and massive. Looking back at Andretti, I was stunned by the effortless, flying trot, truly covering a maximum amount of ground with a minimum amount of effort, truly flying, truly doing it like he should, truly one of the great movers in the breed. I no longer thought about this long limed immature dog as anything but a superstar, as I had never seen a male move like that. I knew right then, I had to have this dog, and thus began a chapter in my life that was to take me to great heights, and extreme lows, things that I could never have know about at that time..."
"Andretti was test bred free of the long coat factor, the blue, liver, and black factors. We have never found an Andretti sired puppy with a missing tooth, or a bad bite. He produced a dark eye and strong vertical ears. He consistently produced excellent hips and elbows. In fact all the vet's at the office we used said he would OFA Excellent, but they came back Good. Nevertheless, he sired several progeny that did OFA Excellent, and there are still progeny closely descended from him that are OFA'ing Excellent. "